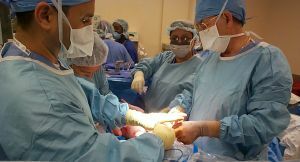 A 76-year-old patient on dialysis with two failed and diseased kidneys had the wrong kidney removed by a surgeon at Mount Sinai Medical Center In New York City. The patient is currently doing well after doctors subsequently removed the second failed kidney. The surgeon has since been relieved from his medical and administrative duties. A Sinai spokeswoman apologized for the error, saying it should never have happened at Mount Sinai. The hospital would not reveal when the incident occurred or who the surgeon was that performed the botched operation. Medical errors happen every day, but few are on this level of seriousness. Wrong side surgeries take place at various hospitals throughout the country, despite the fact that many facilities take great efforts to eradicate these types of mistakes in operating rooms. In July 2008, a surgeon at a Minneapolis hospital removed the wrong kidney from a cancer patient. The doctor argued that he was distracted by beeper calls and other patients in his care when he made a mistake on the patient’s chart, resulting in the failed surgery. While this incident may seem like a slam dunk medical malpractice case, a patient that has endured this type of injury still needs to enlist the help of a NYC Medical Malpractice Attorney at Whittel & Melton to obtain any and all possible compensation and benefits. To prove that medical malpractice occurred, it must be demonstrated that the victim was harmed by the medical mistake. While the hospital announced that the victim is doing well, it is unknown whether any physical harm fell upon the victim. Regardless, the patient could have suffered mental and emotional anguish, something that victims can seek financial compensation for through a medical malpractice lawsuit. Victims of medical errors or surgical mistakes have the legal right to pursue compensation for their pain, suffering, mental and emotional distress, disfigurement, lost wages and medical expenses. In many medical malpractice suits, punitive damages may also be sought. Punitive damages are meant to punish the person responsible for a negligent or careless act that causes either severe personal injury or wrongful death. Generally, in medical malpractice cases, damages are sought against the surgeon and/or the hospital. If you or a loved one has been a victim of medical malpractice in NYC or the surrounding areas, contact a NYC Medical Malpractice Attorney at Whittel & Melton online or call 866-608-5529. No matter how minor or how major the event was, you have a legal right to pursue a claim against negligence that could have caused personal injury or even wrongful death. Remember, there is a statute of limitations in place for injury victims, so it is best to take appropriate action as soon as possible after a traumatic event. We can begin helping you immediately, so call us today!